Whenever I move, that’s Aikido. Aikido is a Japanese martial art developed by Morihei Ueshiba (often referred to by his title ‘O Sensei’ or ‘Great Teacher’). On a purely physical level it is an art involving some throws and joint locks that are derived from Jujitsu and some throws and other techniques derived from Kenjutsu. Aikido focuses not on punching or kicking opponents, but rather on using their own energy to gain control of them or to throw them away from you. It is not a static art, but places great emphasis on motion and the dynamics of movement. Upon closer examination, practitioners will find from Aikido what they are looking for, whether it is applicable self-defence technique, spiritual enlightenment, physical health or peace of mind. O Sensei emphasized the moral and spiritual aspects of this art, placing great weight on the development of harmony and peace. “The Way of Harmony of the Spirit” is one way that “Aikido” may be translated into English. This is still true of Aikido today, although different styles emphasize the more spiritual aspects to greater or lesser degrees. Although the idea of a martial discipline striving for peace and harmony may seem paradoxical, it is the most basic tenet of the art. Aikido was originally developed by one man, O Sensei. Many students who trained under O Sensei decided to spread their knowledge of Aikido by opening their own dojos. Due, among other things, to the dynamic nature of Aikido, different students of O Sensei interpreted his Aikido in different ways. Thus different styles of Aikido were born. The more common are listed here along with a brief explanation of what is different about the style. Each style has its own strengths and weaknesses, but all are firmly rooted in the basic concepts which make Aikido the unique art that it is. None should be considered superior or inferior to any other, but rather an individual must find a style which best suits him or her. Outside factors such as geographic location may of course limit one’s options. No matter which style you choose, you are going to be taught that particular instructor’s interpretation of it, and you yourself are going to develop your own particular Aikido. One might say that there are as many different styles of Aikido as there are practitioners. Since this list is going to be challenging enough without looking for extra work, we’ll restrict our definition of Aikido to mean styles that clearly trace their lineage to Ueshiba O Sensei. The classification into categories is fairly arbitrary. Here is a list the schools that developed from pre-war teachings. This is the name given to the art O Sensei was teaching early in his development. It is very close in style to previously existing Jutsu forms such as Daito-ryu Aiki-Jutsu. Most of the early students of O Sensei began during this period and much of the early practice overseas was in this style (e.g. Abe Sensei’s teaching in the UK in the 50s). This form was developed by Minoru Mochizuki, who was an early student of O Sensei and also of Jigoro Kano Sensei at the Kodokan. This style includes elements of Aiki-Budo together with aspects of Karate, Judo and other arts. This is the style taught by the late Gozo Shioda. Shioda Sensei studied with O Sensei from the mid-30s. After the war, he was invited to begin teaching and formed the organisation known as the Yoshinkan. Unlike many later organizations, the Yoshinkan has always maintained friendly relations with the Aikikai both during and after O Sensei‘s life. The Yoshinkan is a style of Aikido generally concerned with practical efficiency and physically robust techniques. It is taught to many branches of the Japanese Police. The international organization associated with the Yoshinkan style of Aikido is known as the Yoshinkai, and has active branches in many parts of the world. In recent years, there have been a number of offshoots of this style, usually developing for political reasons. This includes most of the variants taught today. Most of these “styles” are taught by various senior students of O Sensei, with the divergences coming after the death of the Founder. Most would claim to be teaching the art that O Sensei taught them – and this is probably true even though some have little in common with others! Taken together with O Sensei‘s notorious obscurity in teaching style, the story of the elephant and the blind men may give us some clue as to how this could have come about . Most of us have our biases and preferences amongst the various styles but can recognize that all have their strengths and weakness and we all have something to learn from all of them. The Aikikai is the common name for the style headed by Moriteru Ueshiba, O Sensei‘s grandson, as taught under the auspices of the International Aikido Federation. Most regard this school as the mainline in Aikido development. In reality, this “style” is more of an umbrella than a specific style, since it seems that many individuals within the organization teach in quite a different manner. The Aikido taught by Ueshiba Sensei is generally large and flowing, with an emphasis on a standard syllabus and little or no emphasis on weapons training. Other teachers within the auspices of the Aikikai (like Saito Sensei) place much more emphasis on weapons practice. The style taught by Morihiro Saito, based in the Iwama dojo, is generally considered sufficiently stylistically different from mainstream Aikikai that it is named individually, even though it still is part of the Aikikai. Saito Sensei was a long time uchi deshi of O Sensei, beginning in 1946 and staying with him through his death. Many consider that Saito Sensei was the student who spent most time directly studying with O Sensei Saito Sensei says he is trying to preserve and teach the art exactly as it was taught to him by the Founder. Technically, Iwama-ryu seems to resemble the Aikido O Sensei was teaching in the early 50s mainly in the Iwama dojo. The technical repertoire is larger than in most other styles and an emphasis is placed on weapons training. One of the most noticeable splits in the Aikido world occurred in 1974 when Koichi Tohei, then the Chief Instructor at the Aikikai, resigned from that organization and founded the Ki no Kenkyukai to teach Aikido with strong emphasis on the concepts of Ki. Since that time, there has been little interaction between the traditional schools and the Ki schools. All of these arts tend to refer to themselves as Ki Aikido, even though there is little contact between some of the styles. The style founded by Koichi Tohei – Aikido with Mind and Body Unified. Tohei Sensei places a great deal of emphasis on understanding the concept of Ki and developing this aspect independently of the Aikido training for application to general health and daily life. This style is one of the softest styles of Aikido and is characterized by soft movements that often involve the practitioner jumping or skipping during the movement. Most schools are not concerned with practical application of the techniques, considering them exercises to further develop Ki.In recent years, Tohei Sensei has been moving further and further away from Aikido and has devoted himself almost exclusively to Ki training. The latest news is that Ki no Kenkyukai has started an initiative to make Shin-shin Toitsu Aikido into an International Competitive sport. One of the other big breaks in Aikido history occurred during O Sensei‘s life when Kenji Tomiki proposed “rationalizing” Aikido training using Kata and Competition. Since that time, there has been little commonality between the Tomiki schools and the mainline Aikido schools. In recent years there have been a number of offshoots of Tomiki-ryu that have abandoned the idea of competition. Founded by Kenji Tomiki, and early student of O Sensei and of Judo founder Jigoro Kano. Tomiki Sensei believed that a “rationalization” of Aikido training, along the lines that Kano Sensei followed for Judo would make it more easily taught, particularly at the Japanese Universities. In addition, he believed that introducing an element of competition would serve to sharpen and focus the practice since it was no longer tested in real combat. This latter view was the cause of a split with O Sensei who firmly believed that there was no place for competition in Aikido training. Tomiki-ryu is characterized by using Kata (prearranged forms) in teaching and by holding competitions, both empty handed and with a rubber knife. Is Aikido better than karate/judo/any other martial art? This is an extremely controversial question and has generated much heated debate in forums such as the rec.martial-arts newsgroup. The answer to this question is very subjective – students of any particular martial art tend to favour that one over any other (otherwise they would probably be studying the other martial art). There are many different but equally valid reasons for studying any martial art, such as for self defence, for spiritual growth or enlightenment, for general physical health, for self-confidence and more. Different martial arts, and even different styles within a particular martial art, emphasize different aspects. This can only be answered by the individual asking the question. The rest of this FAQ may help you in some way towards finding that answer. An alternative way to answer this question is to simply say, ‘No, Aikido is not ‘better’ or ‘worse’ than any other martial art. It is simply different. Can Aikido be used for self-defence? Yes, Aikido can be a very effective form of self-defence However, it can take considerable time and effort before Aikido (or any martial art) can be used effectively in a self-defence situation. Does Aikido take longer time to master and apply than other martial arts? The complex answer is “no” in the sense that I don’t think anyone ever feels like they have “mastered” an art. If they do then they’ve stopped growing, or the art is too simple. In Funakoshi’s autobiography you definitely get the feeling that he doesn’t feel like a “master” and is bemused to be considered one. “Ten years is a long time,” said the boy. “What if I studied twice as hard as all you’re other students?” “Twenty years,” replied the master. Can I train an additional martial art while training Aikido? Yes you may – but it is not recommended. There is no problem in training several martial arts at the same time, but there is one thing to watch out for. If you have not gotten yourself a solid base in one martial art first you are going to confuse yourself when you start your second art. The result is (very likely) that your progress in both martial arts is going to be slower than if you trained first one and then another. It is the Japanese way to commit yourself to one teacher only. It is often said that Aikido does not have any competitions. It is true that the founder of Aikido (Morihei Ueshiba, or O Sensei) felt that competition was incompatible with Aikido, but that does not mean that everyone agrees. One popular style, Tomiki Aikido, does have competition. It is not however considered to be a fundamental part of the style. The majority of Aikido schools do not have any competition. Most Aikido training, even in schools with competitions, is of a cooperative rather than antagonistic nature, with both thrower (nage) and throwee (uke) working as partners and trying to optimize the experience of the other. 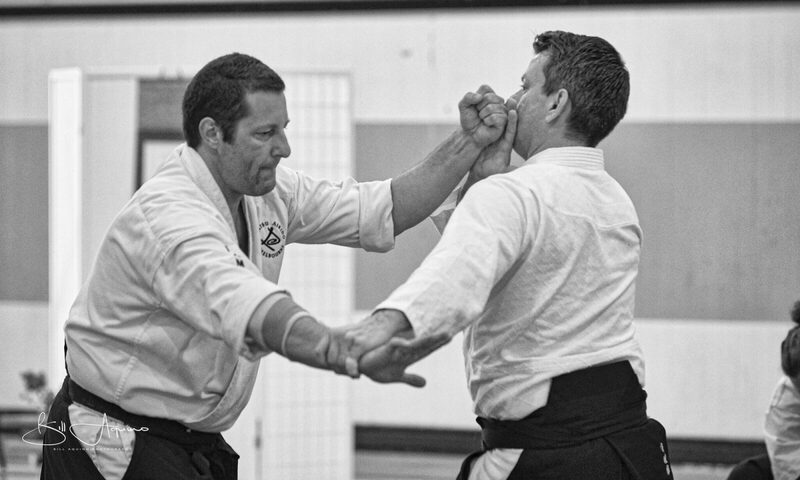 This “working partnership” is also necessary to a) minimize the chance of injury from practicing (potentially dangerous) Aikido techniques, and b) to develop both partners’ capacity to “take ukemi” – to be relaxed and able to take care of oneself when responding to “falling” or being thrown in a martial situation.